This is an under sink kitchen filter with 3 canisters for fluoridated water, where chlorine is the disinfectant. This filter uses materials designed to remove FLUORIDE, Chlorine and all the other contaminants that might be in your municipal water supply. (but not chloramine.) This version contains and extra sediment filter in the first canister. There is no difference in filtration between undercounter and countertop filters. 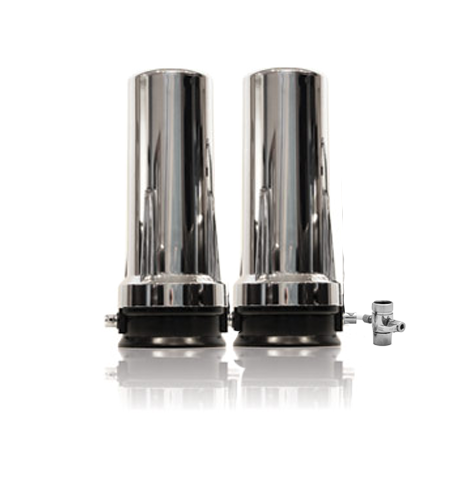 The under sink kitchen filter now has a more robust housing designed to handle 25% more pressure than the industry-standard white canisters. Filtration remains the same. The same cartridges are used. The first canister (first in line for water flow) contains an extra sediment filter. That pre-filter provides extra protection for the more expensive filter media if you have heavy-sediment issues. You might particularly want that if you are in an older city with old pipes. The second canister also has a small sediment filter and media for removing fluoride. You can choose between activated alumina (an inert resin, and not the highly-processed aluminum) OR calcium-based carbon. The carbon is also known as bone char. Their effectiveness is quite similar. Fluoride will be removed beginning at a level of about 96%, and it trends down over time. We do not recommend one fluoride-filtering media over the other. They are both excellent. Change that cartridge only after 6 months. 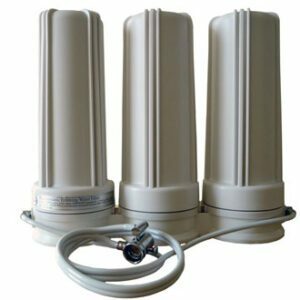 The third canister has 2 more small sediment filters and two additional filter mediums that have been shown to remove free chlorine, chlorination by-products like trihalomethane, heavy metals and more as well as organic compounds including organic-based drugs and hormones. This is one good option if you feel you really only need a 2-canister now, but are concerned that you might want to go up to a 3-canister later (for Chloramines, Radiation, etc.) The replacement sediment filters only cost $7.00. Should want to later, you simply replace the sediment filter with whatever media you need, without having to return the unit for retro-fitting. This under sink kitchen filter uses the best and the most filter material so that your filter does more and lasts longer. THIS FILTER USES THE RIGHT MATERIALS TO WORK ON ALL CATEGORIES OF CONTAMINANTS, including chemical, organic, sediments, metals, odor and tastes. And adds a canister to work on fluoride. There is a LOT of the top quality filter material in this filter system. And the filtration is improved by us of the FOAM ADVANTAGE with the kdf. The combination of filter materials in this under sink kitchen filter have been shown to remove chlorine, chlorination by-products like trihalomethane, heavy metals like lead, chromium, sediment, algae, molds, hormones, pesticides, pharmaceuticals, mtbe, scale, bad taste, odors and hundreds of contaminants. Bacteria cannot grow in the carbon because of copper-zinc. To see a sample list of contaminants filtered, see What Is Filtered?. Click here to see Certifications. Comes with SR-25, Fluoride and Standard KR101N cartridges. A standard faucet is included. That is placed through the opening in your sink. See PHOTOS FOR OPTIONS. The faucets swivel. If you want to upgrade the faucet, select chrome or brushed nickel below. Undercounter filters should be installed by a plumber. It is a quick and easy job for them, usually taking about a half hour. WHY? Read this: Get a plumber. We love our new under the counter filter from Friends of Water. We thoroughly researched various filters and took our time until we found what suited us best. I am extremely impressed with their customer service. Timothy called me back and spoke with me several times, answering all of my questions each time. He was very well informed about his products (this was not always the case with some other companies). I also found their prices very reasonable compared to some other companies. I highly recommend this company and their products!